Does the term “craft keg” get on your nerves? It sure gets on mine… it seems to have surfaced out of corners of the industry where they’d not know “craft beer” if it leapt out of the bottle and smacked them on their suit-trousered backsides. What’s more we now have a large number of publicans who’ve latched onto this to the extent that “craft beer” is, to them, defined as “non-mainstream keg beer”. Reasons for this are manifold. Certain larger distributors and breweries are now pushing “craft” strongly – but under that moniker putting forward nowt but a small selection of national/international beer brands that are in keg format only (i.e. Camden, Meantime, Sierra Nevada, etc). It is these salespeople who’re doing most of the “informing” across the wider industry at the moment – in my area at any rate. To back this up certain high-profile breweries have tried to jump on the bandwagon producing their own “craft” ranges – and we see things like Greene King Nobel Lager and Charles Wells / Dogfish Head DNA in keg pushed as their “craft offering”…. 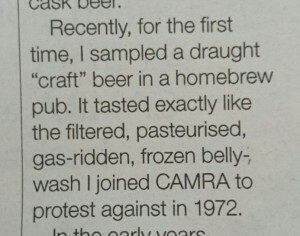 Then there is a very noisily vocal CAMRA minority – grasping for something to fight against they’ve targeted “craft” as clearly being the enemy – as being “fizzy bellywash”. There is also BrewDog, undoubtedly the UK’s most successful “craft brand” – who used the craft rhetoric back when they did mainly cask beers but have been a keg-only brewer for some time now so people looking to them see the “craft brewery” => “keg beer” link. Finally there is us… those of us who fell in love with the craft beer ethos years ago. In a hipsteresque-fashion we jumped on the bandwagon before it was cool… for the fun ride… only to have let the wagon be taken away from us. We can’t see who’s driving it now but we know they’ve taken several wrong turns and sometimes we just wish they’d pull over so we could get off. We’ve failed to protect the simple ethos that “craft beer” is all “good beer”, we’ve let our own terminology run away from us. Can we rescue it? I’m not optimistic. Then again we do have loads of regional level breweries whacking “craft” on their cask pumpclips… maybe they’ll “save” it for us. @StevenageDave I'll guarantee you most of the headline "craft brewers" themselves won't agree. Same beer goes in cask & keg in most cases. This entry was posted in Uncategorized by Yvan Seth. Bookmark the permalink. It drives me nuts, too. To reverse engineer if from my personal “I know it when I see it”, I tend to think of craft beer as something like “breweries taking inspiration from US and other world styles, with an open minded view of means of dispense, a commitment to variety and innovation, and an unwillingness to compromise quality in the name of accessibility or reducing costs.” And that’s certainly what I’d like to see more of around the place. But it’s a bit of a mouthful and probably hard to get across quickly. Oh, aye, I agree that “craft beer” as per my worldview cannot be pinned down. I’m not entirely sure it needs to be… and I certainly have no idea how it could be defined. That’s part of the problem… big-industry types have now suggested a much more graspable definition (non-mainstream keg) and it is running away with the ball. I’ve never really liked “craft beer” as a word applied to specific beers, or even breweries. I think “craft beer” is an ethos and community. I think the craft beer experience is one defined by diversity. A bar that serves all the usual unchanging stuff plus permanent Punk IPA on one keg font… totally not getting it, totally failing at “craft”. In fact a whole lot less craft than a simple cask boozer with rotating guest beers. The whole cask ale / CAMRA scene is a craft beer scene, more so than not it celebrates diversity & quality – it is a large(majority?) subset of the whole craft beer world in the UK. The CAMRA movement has got good beer back into pubs in the form of cask ale, and more often than not pushes further for diversity of style and freedom from tie (freedom of choice). The craft beer movement covers this as well, but doesn’t limit itself to cask – why have great cask on one hand and nothing but multinational-brewed lowest-common denominator beer on keg. We want to see diversity, quality, and flavour across the whole bar… maybe that is a threat to CAMRA, a world in which “all keg beer is chemical fizz” is probably a much healthier one for traditional cask beers. Surely the term “craft keg” originated as a useful means of distinguishing it from “old keg” such as John Smith’s. The fact that many people now seem to equate it with “craft” per se is a separate issue. I agree that it is likely that “craft keg” arose simply as a means of distinguishing “new wave keg” from “mainstream keg” – I do mention in the post that this is how it is seen as a “market niche” by many (and is pushed in this way by some sellers). The problem is that I have seen “craft keg” become a synonym for “craft beer” in the eyes of many a non-craftster (i.e. normal folk), and the aforementioned sales folk selling “craft” are perpetuating this concept as that is the easy sales pitch. They already sell cask as cask afterall, and this new-wave keg stuff needs a catchy name… “craft” filled that role nicely. And thus the term “craft” is running away from its original meaning. I fully take the point that “craft” is increasingly being used to mean “craft keg”, which in the wider scheme of things is unhelpful, but if you don’t call it that, what snappy name do you use to distinguish “quality” keg beer from John Smith’s? We also have “craft cans” now, of course. Yep, it is a conundrum. The “craft keg” concept slides into the slot too neatly and don’t think there is any hope of killing off “craft keg”. I am resigned to that. I see some hope for the word “craft” not losing its “proper” (IMO) sense by ensuring it is applied to beer in all formats often and prominently. Thus my resolve to ensure I push my stock as “craft beer” – all of it, regardless of packaging.